Charlotte Prodger’s installations and performances reroute elements of display and design alongside decontextualised narratives, to create an itinerant space of desire. Multiple subjectivities and coded erotics are held in tension with the pared-back formalism of her installations, in which the rectilinear forms of audio-visual technology echo those of minimalist sculpture. The Hantarex monitor has been a core component of Prodger's installations and she has recently built display mechanisms specifically to fit their form. The Hantarex was originally designed for modular use in public spaces such as betting shops, train stations, amusement arcades, night clubs and shopping centres, while the Sony Cube originated as a broadcast reference monitor for edit suites. Their market has subsequently shifted toward art galleries and museums. Markets takes it title from a thoroughbred racehorse part-owned by Matthew Fitts. A convention when naming racehorses is to splice together, either conceptually or literally, the names of the foal's parents. 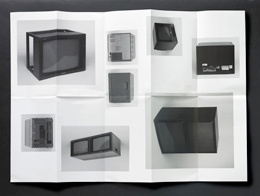 Markets considers the video monitor on one level as a blank, interchangeable vessel for the purposes of channeling content; and on another level as a discrete entity with its own design history, social context and relationship to the human body. Central to this exhibition is the slippery idea of the version, where something produces a mutation of itself. This concern is approached through ergonomic design, language structures, and the compromises and amalgams implicit in the collaborative process itself. Charlotte Prodger (b.1974, Bournemouth) lives and works in Glasgow. 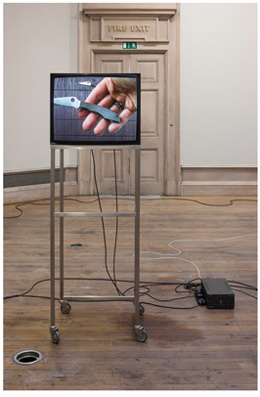 Solo exhibitions include handclap/punchhole, Kendall Koppe, Glasgow (2011); Percussion Biface 1-13, Studio Voltaire, London; :-* , Intermedia CCA, Glasgow, 2012; Jason Loebs and Charlotte Prodger, Essex Street, New York (2012) and Nephatiti, Glasgow International Director's Programme, 2014. Selected group exhibitions include LUX Biennial of Moving Images, ICA, London, 2011; Old Photocopier, HOTEL, London, 2012; Frozen Lakes, Artists Space, New York, 2013; Costume: Written Clothing, Tramway, Glasgow, 2013; Holes in The Walls, Kunsthalle Freiburg, 2013 and Annals of The Twentieth Century, Wysing Arts, 2014. Prodger's writing has been published in 2HB and F.R.DAVID. She has a solo show at Inverleith House, Edinburgh in 2015 and is represented by Kendall Koppe Gallery.